The long anticipated netbook based on Intel Pineview will not hit commercial market by year end, despite the readiness and willingness and by most major Taiwanese companies to release it before holiday season. According to reliable source, this is one of the restrictions posted by Intel Corp as common practice to not disclosing any of third parties platform before the official launching and announcement of its Atom N450 processor. As you may aware, some solutions such as Lenovo Ideapad FL5-B3 and Asus Eee PC 1008P have been spotted in FCC and it is almost ready for consumers but certain restriction by giant chipmaker may have push its schedule out. On top of this, it could also be due to inventory balance and intention to clear up all its existing models before pushing a next generation products to avoid cannibalization. 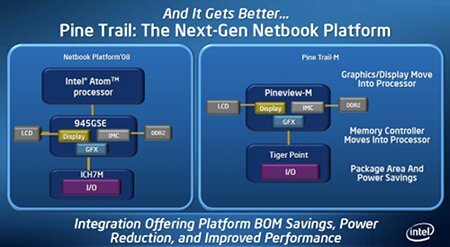 If you recall, Pinetrail platform will be integrated with both Pineview (or officially named as N450) and TigerPoint (officially named as NM10) as two-chip design aiming to provide a much more cost and space effective netbook solution. And with its unique architecture that able to pack both the memory and graphics controller into its core die, it is expected to be able to boost up the overall system performance without exceeding thermal envelope of seven watt suitable for many fan-less applications. The official release date will be on January 11th, 2010 and you can expect most of the machines will be preloaded with Windows 7 to continue great momentum of Atom family in netbook market.